Term used on the label to designate an unchaptalized wine before the german wine law 1971. Minor white grape of unknown origin thought by some to be a cross between Sylvaner and Pinot Blanc. Suitable for growing in a wide range of soils including heavy or chalky areas but prefers granite content. Shows a tendency towards Coulure, i.e. 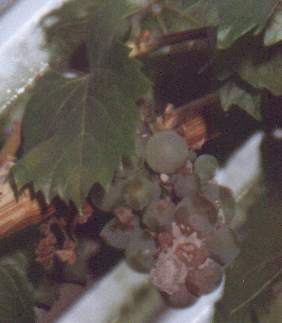 poor fruit set with immature berries falling off after veraison (blossoming). Widely grown in sections of the Burgenland and Wachau regions, and other areas, of Austria producing soft, full-bodied wines with nutlike aroma. Also commonly used in white wine blends such as are found in Gumpoldkirchen. Common name for Botrytis cinerea, the famous fungus of more than a few fabulous dessert wines. See Edelfaule, Pourriture Noble. (white grape) A crossing of Madeline angevine and Silvaner 1n 1975. There are only about 170 ha planted mostly in Baden. Has moderate cold hardiness and is resistant to many diseases. Early September ripening. Claimed to produce good quality white wine. (white grape) This is a new variety of the Staatliches Weinbauinstitut at Freiburg in 1939.It derives from a cross between Silvaner and Gutedel, grows in the Markgräflerland, as a supplement to Gutedel has become a well-established member of the varietal spectrum. Nobling is late ripening and makes fruity and complex wines with a delicate and fragrant bouquet combined with a sprightly acidity and the grape variety attracts edelfaule easily. Slight enlargements occurring at more or less regular intervals along the length of vine shoots and canes. One leaf develops at each of these nodes and a new bud forms in the axil at the node also. The total odor of a wine, including aroma and bouquet.